Abstract. The Ayeyawady delta is the last Asian megadelta whose evolution has remained essentially unexplored so far. 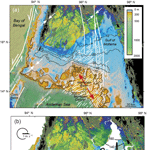 Unlike most other deltas across the world, the Ayeyawady has not yet been affected by dam construction, providing a unique view on largely natural deltaic processes benefiting from abundant sediment loads affected by tectonics and monsoon hydroclimate. To alleviate the information gap and provide a baseline for future work, here we provide a first model for the Holocene development of this megadelta based on drill core sediments collected in 2016 and 2017, dated with radiocarbon and optically stimulated luminescence, together with a reevaluation of published maps, charts and scientific literature. Altogether, these data indicate that Ayeyawady is a mud-dominated delta with tidal and wave influences. The sediment-rich Ayeyawady River built meander belt alluvial ridges with avulsive characters. A more advanced coast in the western half of the delta (i.e., the Pathein lobe) was probably favored by the more western location of the early course of the river. Radiogenic isotopic fingerprinting of the sediment suggests that the Pathein lobe coast does not receive significant sediment from neighboring rivers. However, the eastern region of the delta (i.e., Yangon lobe) is offset inland and extends east into the mudflats of the Sittaung estuary. Wave-built beach ridge construction during the late Holocene, similar to several other deltas across the Indian monsoon domain, suggests a common climatic control on monsoonal delta morphodynamics through variability in discharge, changes in wave climate or both. Correlation of the delta morphological and stratigraphic architecture information on land with the shelf bathymetry, as well as its tectonic, sedimentary and hydrodynamic characteristics, provides insight on the peculiar growth style of the Ayeyawady delta. The offset between the western Pathein lobe and the eastern deltaic coast appears to be driven by tectonic–hydrodynamic feedbacks as the extensionally lowered shelf block of the Gulf of Mottama amplifies tidal currents relative to the western part of the shelf. This situation probably activates a perennial shear front between the two regions that acts as a leaky energy fence. Just as importantly, the strong currents in the Gulf of Mottama act as an offshore-directed tidal pump that helps build the deep mid-shelf Mottama clinoform with mixed sediments from the Ayeyawady, Sittaung and Thanlwin rivers. The highly energetic tidal, wind and wave regime of the northern Andaman Sea thus exports most sediment offshore despite the large load of the Ayeyawady River. How to cite: Giosan, L., Naing, T., Min Tun, M., Clift, P. D., Filip, F., Constantinescu, S., Khonde, N., Blusztajn, J., Buylaert, J.-P., Stevens, T., and Thwin, S.: On the Holocene evolution of the Ayeyawady megadelta, Earth Surf. Dynam., 6, 451-466, https://doi.org/10.5194/esurf-6-451-2018, 2018.